It’s Dana here and I’m back with another card featuring our new release! If you haven’t joined our New Release Blog Hop, please click HERE and get a chance to win amazing prizes! For today’s card, I started by stenciling A2 sized watercolor paper with Square Brick Stencil using Vintage Photo Distress Ink. I added clean water to each bricks using flat watercolor brush and let them dried. Then, I die cut window frame from woodgrain card stock using Studio Katia European Window Die. I stamped Potted Flowers Stamp Set images onto watercolor paper in brown. I watercolored them and cut them out using Coordinating Dies. I mounted a piece of watercolor paper for window background and stamped a sentiment and mini hearts from Potted Flowers Stamp Set. To finish, I mounted all elements as shown in the picture. I am glad to show you a lovely card with cacti images. 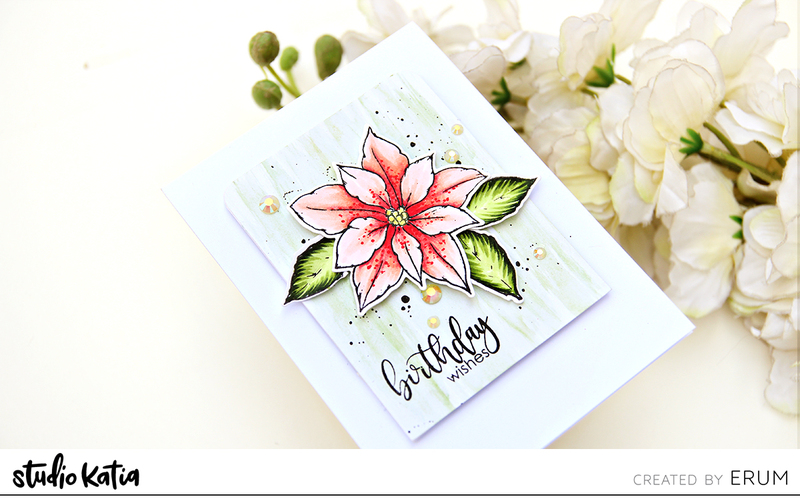 I made this card using Cactus Hugs stamp set. I stamped the images with light ink and coloured with pencils. I also made a tablecloth, as if the pots were on a table. To decorate the tablecloth, I used newly released Grid stencil. I foam mounted the tablecloth and few of the coloured images to add dimension. I finished off my card with some sparkling crystals. Today it is my last post as member of Studio Katia Design Team. It was a wonderful period in my creative career. Thank you for all your comments and attention! How you like our new release products? I’m so exited! Love every item. And today I want to share with you two clean and simple cards I made only with new dies. For my first card I used new window die. I cut this window twice: from woodgrain cardstock and from gold glitter cardstock. I decided to combine sparkles and texture on woodgrain cardstock on my card. Inside of my card I made a sky scene with birds. On a white panel I applied orange and pink color of distress ink and I draw few simple birds with black gel pen. And I stamped a sentiment under my window, it’s very helpful to have stamping tool to stamp on textured cardstock, but if you haven’t one you can fill white gaps on stamped image with black pen. For my second card I used few die cuts I made with new shaker heart die. I really love monochrome cards and on this card I wanted to see some gold accents. I simply diecut a sentiment from gold mirror cardstock to get a gold main element on my card. I adhered all die cuts with Studio Katia glue and to embellish my card I used glitter crystals. They look amazing on the card. Hope you like these cards! Have a nice day! It’s Dana here and I’m back with new card featuring our new release! Here is what I came up with. To start, I die cutting heart background panel from cold pressed watercolor paper using Scallop Hearts Cover. I then added watercolor wash to each hearts and let them dried. I took a piece of red card stock and heat embossed a sentiment in white. I used Jawsome Stamp Set. I mounted background panel onto A2 sized craft card base. Then I popped up all small hearts and sentiment banner using foam tape as shown in the picture. As a final touch, I embellished with Sparkling Crystals. Hope you enjoyed this card. Happy crafting! It’s is finally looking like the snow is melting and Spring weather is on its way! I just can’t wait for it to warm up as maybe can tell by this Under the Sea Shaker card. Interactive cards are definitely one of my favorite kinds of cards to make and to give away. To begin this card I stamped out images from the Mermaid For Each Other and the Under the Sea sets and then die cut them with their coordinating dies. They were colored in using Copic markers. Next, I blended out some Distress Oxide Inks (tumbled glass, mermaid lagoon and wilted violet) onto a piece of Bristol paper. Then I used the Brush Stroke Waves stencil to add a layer of Glimmer Paste onto the background. For the top panel, I used the Fancy Circle Dies to die cut the circle window and then used the frame from the Dotted Patterns Set 3 to cut out the panel. Next, I adhered a piece of acetate to the window opening and glued the water plants along the edge of the window. To the background, I glued the coral piece and the merman I popped up with a piece of foam tape. Not sure if you can tell from the photos but the mermaid was the only image I glued on the top of the acetate. To create the shaker portion of the card I used foam tape and added it to the outside edge under the card front panel. Before attaching it to the background I added my sequin bits that consisted of Shimmering Ice Fusion Sequins and Sparkling Crystals to the center of where the window would be. I then removed the protective adhesive from the foam and lined it up with the background. I then attached that to a card base that I had glued a piece of light blue cardstock to. 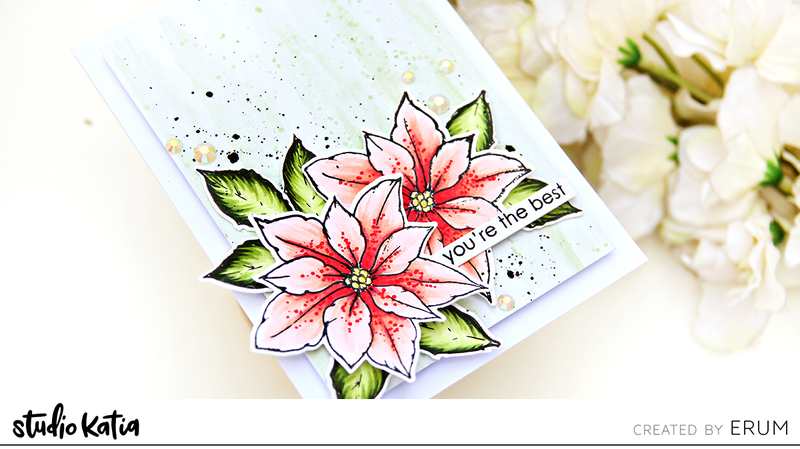 The sentiment I used on the card front comes from the Blooming Bunch Stamp set. For a bit of sparkle on the images, I used Liquid Pixie Dust on the mermaid tails and the coral. I hope you got some inspiration from this fun Under the Sea Shaker card. Oh, how I would love to be swimming in that magical ocean right now! Hi guys! It’s Galina. Today I want to share with you a floral card with pretty blue stripes. I started with stamping stripes onto white card panel. I applied two shades of blue ink (at once) on the stamp and press it to paper. Inks are blend nicely on a stamp and I get pretty background for my card. My main accent is a floral bouquette. I choose yellow, orange and red colors of distress markes to color my image. I stamped this flowers with archival black ink on the watercolor paper, because my watercolor has a nice texture I got some white gaps on the image, I always fix this with black pen, but only after coloring, in other way ink from pen can react with water. At last I cut a “thank you” sentiment from black cardstock. At first I adhere flowers with 3d foam and next I find place on the card for me sentiment, to glue the sentiment I used Studio Katia’s glue, it has a small tip and with this glue I can easily attach any delicate die cuts, like this one I used. Hi there! It’s Natalia here. 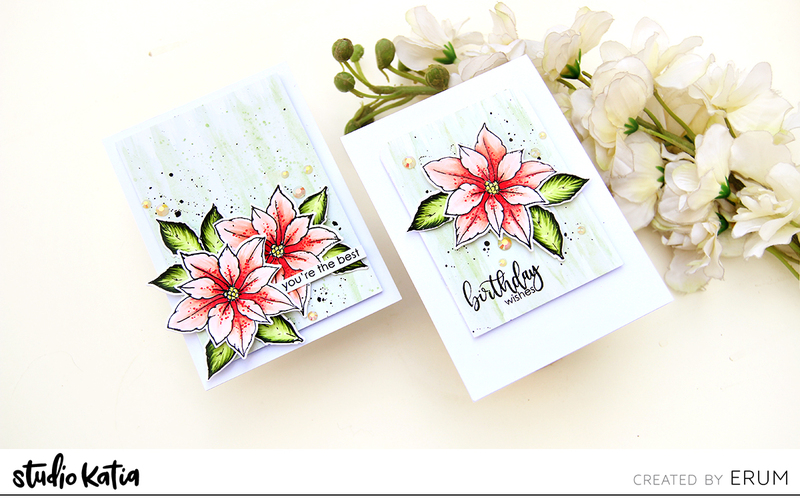 Today I want to share with you my card with UNDER THE SEA and SHELL-EBRATION stamp sets. First, I stamped the cute images from the UNDER THE SEA and SHELL-EBRATION. Colored with copic markers and die cutting them with coordinating dies. I made highlights using white and silver pen. Next, I blended some distress inks onto white piece of paper. Placed all the elements on the paper panels using double-sided foam tape. Heat embossed the sentiment from UNDER THE SEA using white powder.